On February 11, 2019, Elevate Credit, Inc. (the "Company") issued a press release announcing its financial results for the quarter and year ended December 31, 2018. 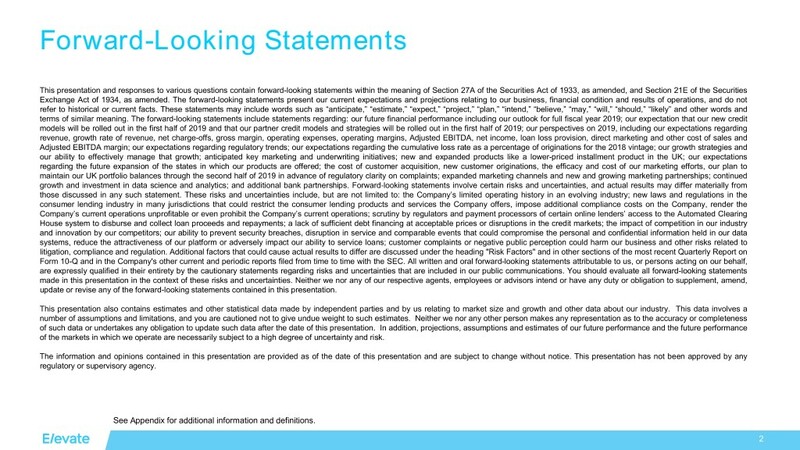 The full text of the press release, along with the slide presentation to be used during the earnings call on February 11, 2019, are furnished herewith as Exhibits 99.1 and 99.2, respectively. Press release, dated February 11, 2019. 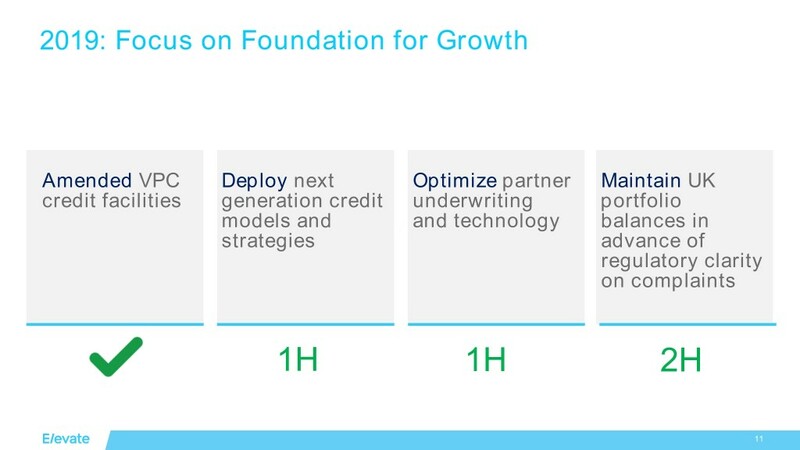 Presentation slides for earnings call on February 11, 2019. FORT WORTH, TX - February 11, 2019 - Elevate Credit, Inc. (NYSE: ELVT) (“Elevate” or the “Company”), a leading tech-enabled provider of innovative and responsible online credit solutions for non-prime consumers, today announced results for the fourth quarter and full year ended December 31, 2018. Net income: Net income for the three months ended December 31, 2018 totaled $4.1 million, or $0.09 per diluted share, compared to a net loss of $12.2 million, or $(0.29) per diluted share, in the fourth quarter of 2017, which included a $12.5 million charge associated with the change in federal tax law in 2017. Excluding the impact from the tax law change, adjusted net income for the fourth quarter of 2017 would have been $0.3 million, or $0.01 per diluted share. Revenue growth: Revenues increased 7.2% for the fourth quarter of 2018 totaling $207.3 million compared with $193.4 million for the fourth quarter of 2017. 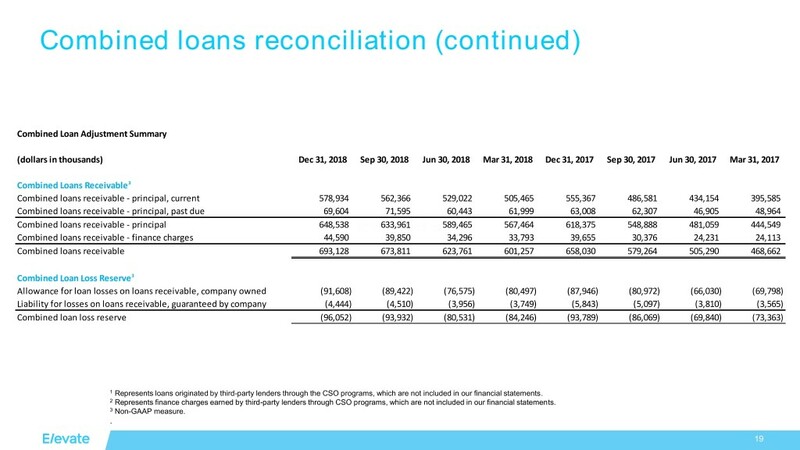 Combined loans receivable - principal: Combined loans receivable - principal totaled $648.5 million, an increase of $30.2 million, or 4.9%, from $618.4 million for the prior-year quarter. Customer acquisition cost: The average customer acquisition cost was $202 in the fourth quarter of 2018, below the targeted range of $250-$300 and lower than $231 for the prior-year quarter. The total number of new customer loans decreased from approximately 95,000 in the fourth quarter of 2017 to 67,000 in the fourth quarter of 2018. Adjusted EBITDA margin: Adjusted EBITDA increased to $31.9 million, up 27.7% from $25.0 million in the fourth quarter of 2017. The Adjusted EBITDA margin for the fourth quarter of 2018 was 15.4%, an increase from 12.9% in the prior year quarter. 1 Adjusted EBITDA, Adjusted EBITDA margin, combined loans receivable - principal, combined loans receivable and adjusted net income are non-GAAP financial measures. These terms are defined elsewhere in this release. 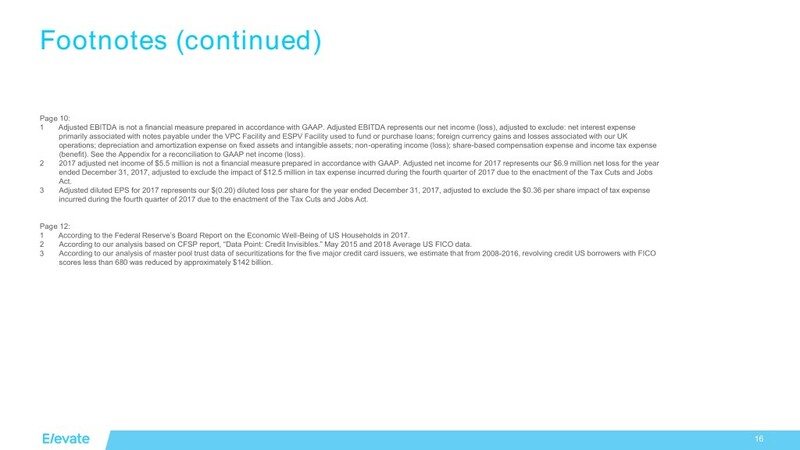 Please see the schedules appearing later in this release for reconciliations of these non-GAAP measures to the most directly comparable GAAP measures. Net income: Net income for the year ended December 31, 2018 totaled $12.5 million, or $0.28 per diluted share, compared to a net loss of $6.9 million, or $(0.20) per diluted share, in the prior year, which included a $12.5 million charge associated with the change in federal tax law in 2017. Excluding the impact of the federal tax law, adjusted net income for the full year 2017 would have been $5.5 million, or $0.16 per diluted share. Revenue growth: Revenues increased 16.9% for the year ended December 31, 2018, totaling $786.7 million compared to $673.1 million for the prior-year period. Adjusted EBITDA margin: Adjusted EBITDA increased to $116.1 million from $87.5 million in the prior year. The Adjusted EBITDA margin for the year ended December 31, 2018 was 14.8%, an increase from 13.0% in the prior year. Customer acquisition cost: The number of new customer loans for the year ended December 31, 2018 totaled approximately 316,000, an increase of 3.6% from 305,000 for the prior year period. The average customer acquisition cost was $245 in 2018, below the targeted range of $250-$300 but slightly higher than $237 for the prior year. There were no material changes from a liquidity and funding standpoint during the fourth quarter of 2018. Elevate Announces Amended Credit Facility. 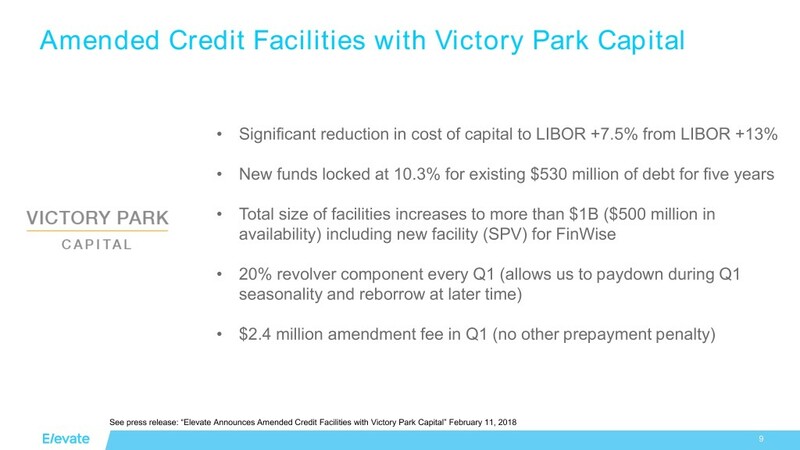 Today, Elevate announced a billion dollar credit agreement with Victory Park Capital which will significantly lower the Company’s cost of capital. The new agreement encompasses all four of Elevate’s products. See press release for more information. 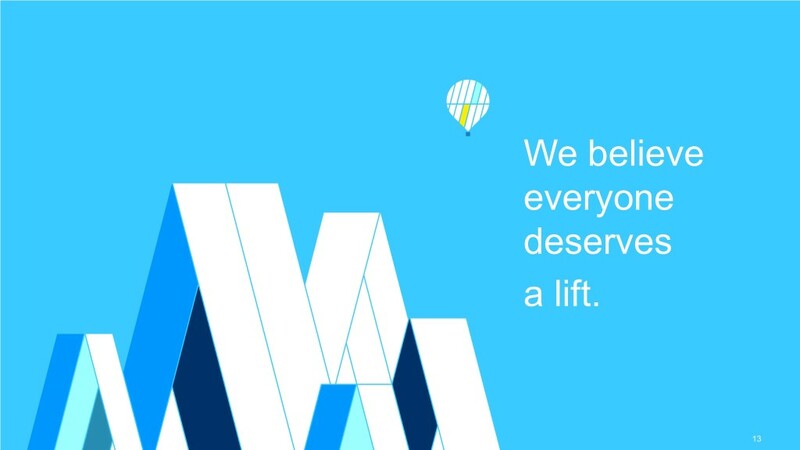 Elevate’s Rise Product Expansion. In the fourth quarter of 2018, the Company licensed the Rise brand to FinWise Bank ("FinWise") to originate loans in an additional 16 states. The FinWise portfolio originated $31 million of loans in the fourth quarter since its launch in October 2018. New Chief Credit Officer. Elevate promoted Company veteran David Peterson as Chief Credit Officer. Mr. Peterson has over 15 years of leadership experience in risk management and operations. He served as Senior Vice President of Risk Management and also held various previous leadership roles including positions at Americredit Financial and Washington Mutual. 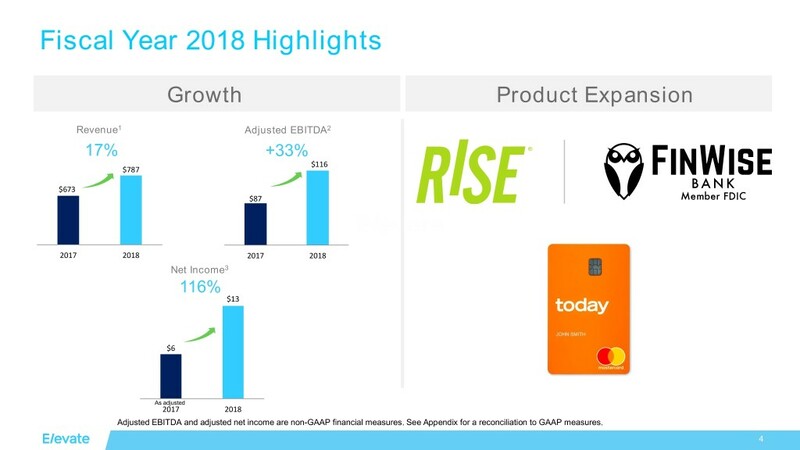 The Company expects revenue growth to be relatively flat during the first half of 2019 with annualized revenue growth of 5% to 10% during the second half of 2019. 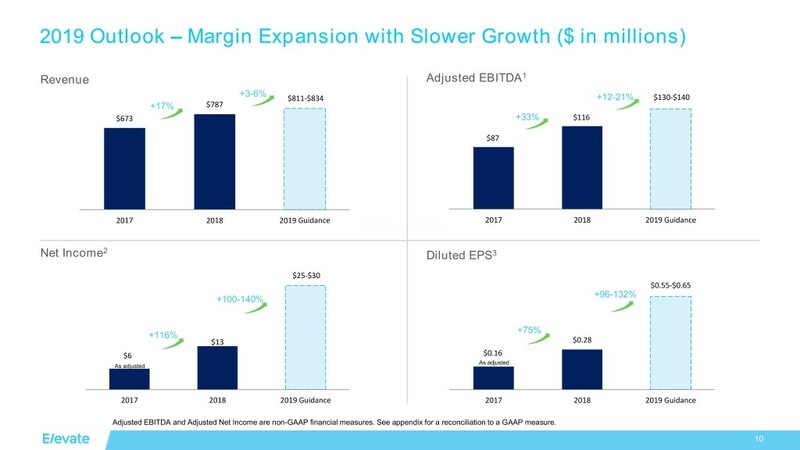 For the full year 2019, the Company expects total revenue of $811 million to $834 million, net income of $25 million to $30 million, or $0.55 to $0.65 in diluted earnings per share, and Adjusted EBITDA of $130 million to $140 million. 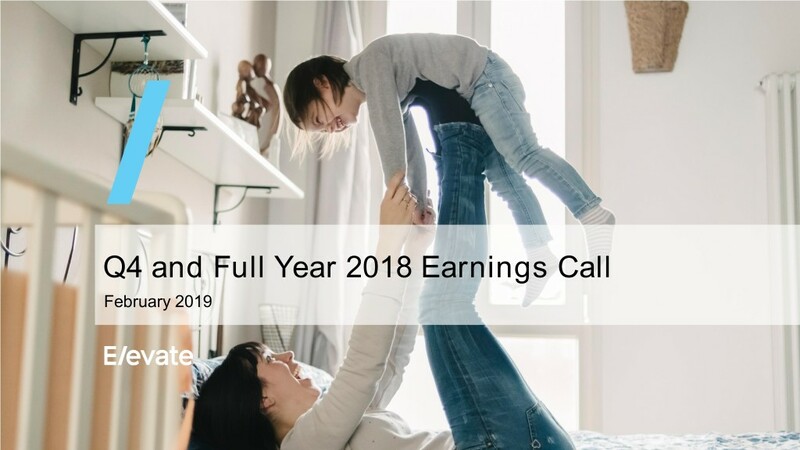 The Company will host a conference call to discuss its fourth quarter and full-year 2018 financial results on Monday, February 11th at 4:00pm Central Time / 5:00pm Eastern Time. Interested parties may access the conference call live over the phone by dialing 1-877-407-0792 (domestic) or 1-201-689-8263 (international) and requesting the Elevate Fourth Quarter 2018 Earnings Conference Call. Participants are asked to dial in a few minutes prior to the call to register for the event. 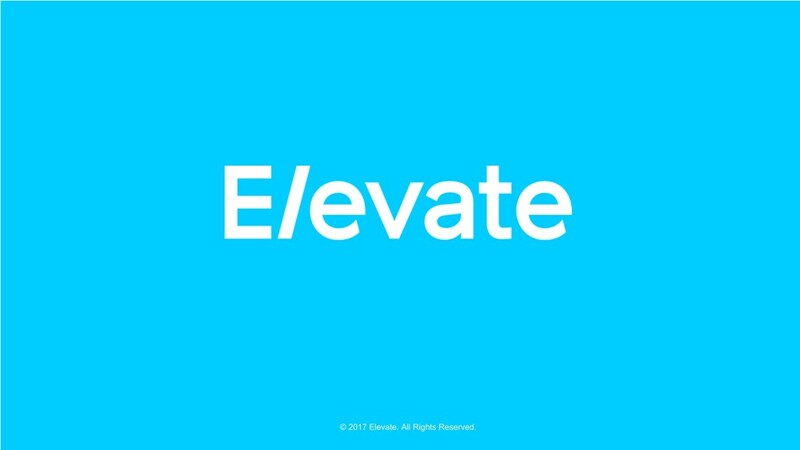 The conference call will also be webcast live through Elevate’s website at http://www.elevate.com/investors. This press release contains forward-looking statements within the meaning of Section 27A of the Securities Act of 1933, as amended, and Section 21E of the Securities Exchange Act of 1934, as amended. Such statements contain words such as "may," "will," "might," "expect," "believe," "anticipate," "could," "would," "estimate," "continue," "pursue," or the negative thereof or comparable terminology, and may include (without limitation) information regarding the Company's expectations, goals or intentions regarding future performance. These statements may include words such as “anticipate,” “estimate,” “expect,” “project,” “plan,” “intend,” “believe,” “may,” “will,” “should,” “likely” and other words and terms of similar meaning. 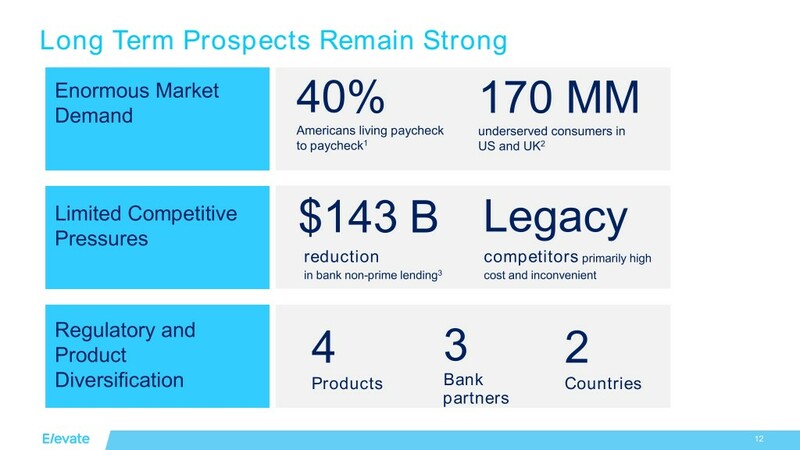 The forward-looking statements include statements regarding: our future financial performance including our outlook for full fiscal year 2019 (including all statements under the heading "Financial Outlook"); our plan to continue to be conservative about growth while we focus on execution and earnings growth in 2019; our beliefs about the core strength of our business and our huge market opportunity to serve the New Middle Class, including in light of the expanded billion dollar credit facility with Victory Park Capital, which lowers our cost of capital significantly, and the continued demand for our products; and the Company’s targeted customer acquisition cost range of $250-$300. Forward-looking statements involve certain risks and uncertainties, and actual results may differ materially from those discussed in any such statement. These risks and uncertainties include, but are not limited to: the Company’s limited operating history in an evolving industry; new laws and regulations in the consumer lending industry in many jurisdictions that could restrict the consumer lending products and services the Company offers, impose additional compliance costs on the Company, render the Company’s current operations unprofitable or even prohibit the Company’s current operations; scrutiny by regulators and payment processors of certain online lenders’ access to the Automated Clearing House system to disburse and collect loan proceeds and repayments; a lack of sufficient debt financing at acceptable prices or disruptions in the credit markets; the impact of competition in our industry and innovation by our competitors; our ability to prevent security breaches, disruption in service and comparable events that could compromise the personal and confidential information held in our data systems, reduce the attractiveness of our platform or adversely impact our ability to service loans; and other risks related to litigation, compliance and regulation. Additional factors that could cause actual results to differ are discussed under the heading "Risk Factors" and in other sections of the Company's most recent Annual Report on Form 10-K, and in the Company's other current and periodic reports filed from time to time with the SEC. 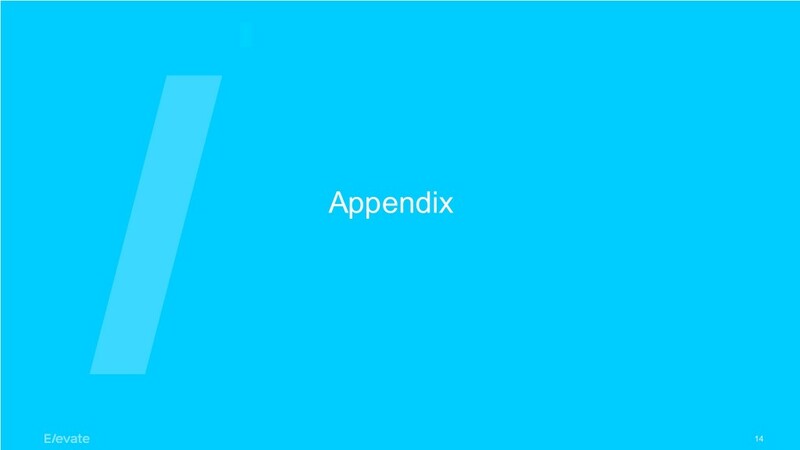 All forward-looking statements in this press release are made as of the date hereof, based on information available to the Company as of the date hereof, and the Company assumes no obligation to update any forward-looking statement. * These balances include certain assets and liabilities of variable interest entities (“VIEs”) that can only be used to settle the liabilities of that respective VIE. All assets of the Company are pledged as security for the Company’s outstanding debt, including debt held by the VIEs. This press release and the attached financial tables contain certain non-GAAP financial measures, including Adjusted EBITDA, Adjusted EBITDA margin, combined loans receivable - principal, combined loans receivable and adjusted net income. 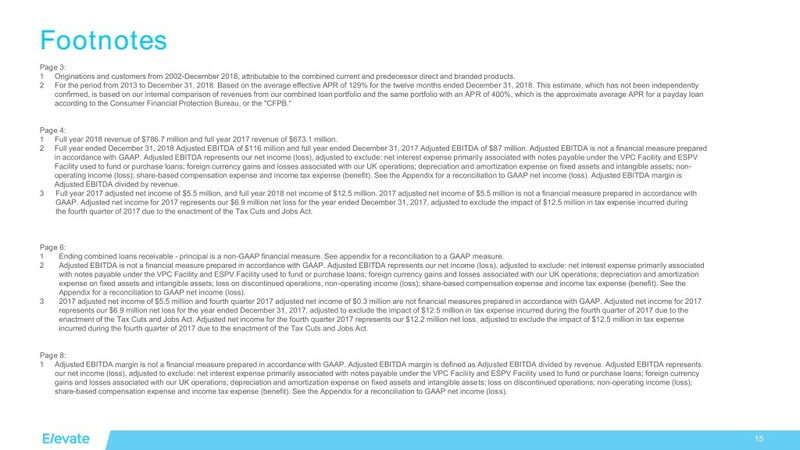 In addition to net income (loss) determined in accordance with GAAP, Elevate uses certain non-GAAP measures such as “Adjusted EBITDA” and "Adjusted EBITDA margin" in assessing its operating performance. Elevate believes these non-GAAP measures are appropriate measures to be used in evaluating the performance of its business. Elevate defines Adjusted EBITDA as net income (loss) excluding the impact of income tax benefit or expense, non-operating income or expense, foreign currency transaction gain or loss associated with our UK operations, net interest expense, share-based compensation expense and depreciation and amortization expense. 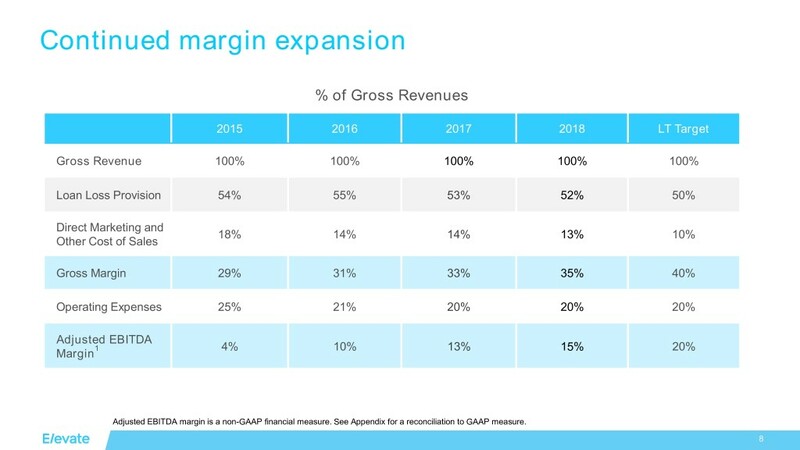 Elevate defines Adjusted EBITDA margin as Adjusted EBITDA divided by revenue. Management believes that Adjusted EBITDA and Adjusted EBITDA margin are useful supplemental measures to assist management and investors in analyzing the operating performance of the business and provide greater transparency into the results of operations of our core business. Management uses this non-GAAP financial measure frequently in its decision-making because it provides supplemental information that facilitates internal comparisons to the historical operating performance of prior periods and gives an additional indication of Elevate’s core operating performance. 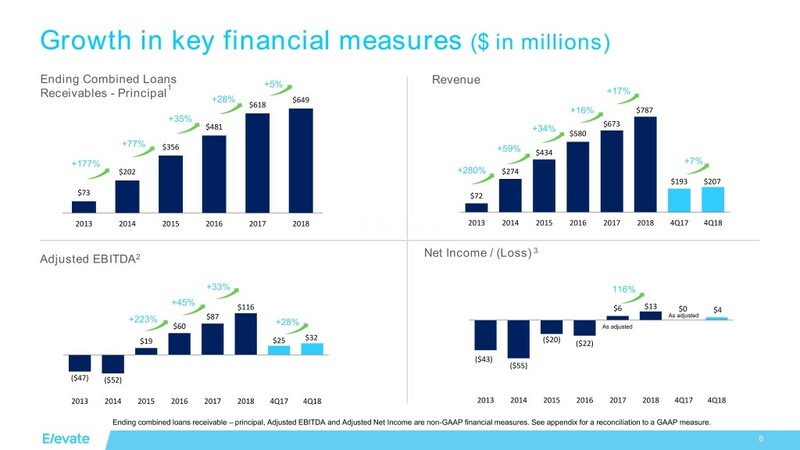 Elevate includes this non-GAAP financial measure in its earnings announcement in order to provide transparency to its investors and enable investors to better compare its operating performance with the operating performance of its competitors. Adjusted EBITDA does not reflect interest associated with notes payable used for funding customer loans, for other corporate purposes or tax payments that may represent a reduction in cash available to the Company. Additionally, Elevate’s definition of Adjusted EBITDA may not be comparable to similarly titled measures reported by other companies. The Company’s Adjusted EBITDA guidance does not include certain charges and costs. The adjustments in future periods are generally expected to be similar to the kinds of charges and costs excluded from Adjusted EBITDA in prior periods. 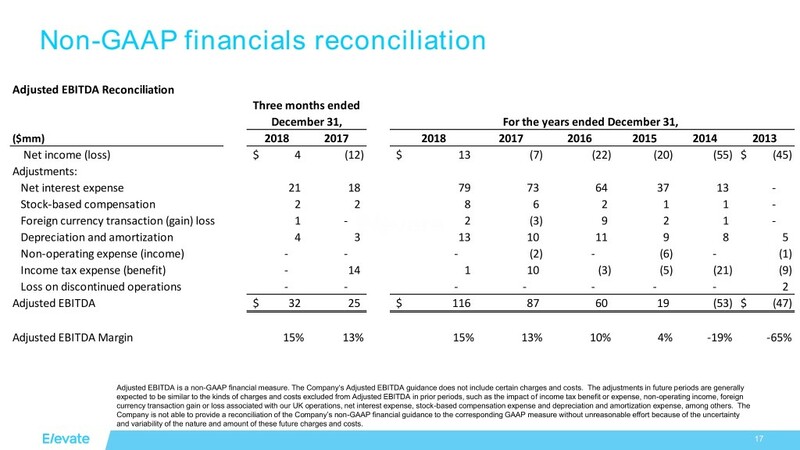 The Company is not able to provide a reconciliation of the Company’s non-GAAP financial guidance to the corresponding GAAP measure without unreasonable effort because of the uncertainty and variability of the nature and amount of these future charges and costs. The Tax Cuts and Jobs Act was enacted on December 22, 2017. U.S. GAAP requires the remeasurement of all U.S. deferred income tax assets and liabilities for temporary differences from the previously enacted tax rate of 35% to the new corporate tax rate of 21%. The cumulative adjustment of $12.5 million was recognized in income tax expense in 2017, which included the enactment date. The following table presents a reconciliation of net income (loss) and diluted income (loss) per share to adjusted net income and adjusted diluted income per share, which excludes the impact of the tax reform. (1) Represents potentially dilutive shares that had not been included in the Company's quarter or year-ended December 31, 2017 diluted weighted average shares outstanding as the Company is in a net loss position under U.S. GAAP. Including these shares would have been anti-dilutive when in a net loss position. Includes loans originated by third-party lenders through the CSO programs, which are not included in the Company's condensed consolidated financial statements. (2) Includes immaterial balances related to the Today Card, which expanded its test launch in November 2018. Average combined loans receivable - principal is calculated using daily principal balances. See the "Combined Loan Information" section for a reconciliation of this non-GAAP measure to the most comparable GAAP measure. Includes immaterial balances related to the Today Card, which expanded its test launch in November 2018. Not a financial measure prepared in accordance with GAAP. See the "Combined Loan Information" section for a reconciliation of this non-GAAP measure to the most comparable GAAP measure. Includes loans originated by third-party lenders through the CSO programs, which are not included in the Company's consolidated financial statements. The Elastic line of credit product is originated by a third party lender, Republic Bank, which initially provides all of the funding for that product. Republic Bank retains 10% of the balances of all of the loans originated and sells a 90% loan participation in the Elastic lines of credit to a third party SPV, Elastic SPV, Ltd. Elevate is required to consolidate Elastic SPV, Ltd. as a variable interest entity under GAAP and the consolidated financial statements include revenue, losses and loans receivable related to the 90% of Elastic lines of credit originated by Republic Bank and sold to Elastic SPV, Ltd.
Beginning in the fourth quarter of 2018, the Company also licenses its Rise installment loan brand to a third party lender, FinWise Bank, which originates Rise installment loans in sixteen states. FinWise Bank initially provides all of the funding and retains 5% of the balances of all of the loans originated and sells a 95% loan participation in those Rise installment loans to a third party SPV, EF SPV, Ltd. Elevate is required to consolidate EF SPV, Ltd. as a variable interest entity under GAAP and the consolidated financial statements include revenue, losses and loans receivable related to the 95% of Rise installment loans originated by FinWise Bank and sold to EF SPV, Ltd.
Elevate defines combined loans receivable - principal as loans owned by the Company plus loans originated and owned by third-party lenders pursuant to our CSO programs. In Texas and Ohio, the Company does not make Rise loans directly, but rather act as a Credit Services Organization (which is also known as a Credit Access Business in Texas), or, collectively, “CSO,” and the loans are originated by an unaffiliated third party. Elevate defines combined loan loss reserve as the loan loss reserve for loans owned by the Company plus the loan loss reserve for loans originated and owned by third-party lenders and guaranteed by the Company. The information presented in the tables below on a combined basis are non-GAAP measures based on a combined portfolio of loans, which includes the total amount of outstanding loans receivable that the Company owns and that are on the Company's consolidated balance sheets plus outstanding loans receivable originated and owned by third parties that the Company guarantees pursuant to CSO programs in which the Company participates. The Company believes these non-GAAP measures provide investors with important information needed to evaluate the magnitude of potential loan losses and the opportunity for revenue performance of the combined loan portfolio on an aggregate basis. The Company also believes that the comparison of the combined amounts from period to period is more meaningful than comparing only the amounts reflected on the Company's consolidated balance sheets since both revenues and cost of sales as reflected in the Company's consolidated financial statements are impacted by the aggregate amount of loans the Company owns and those CSO loans the Company guarantees. Rise CSO loans are funded by a third party lender and are not part of the VPC Facility. 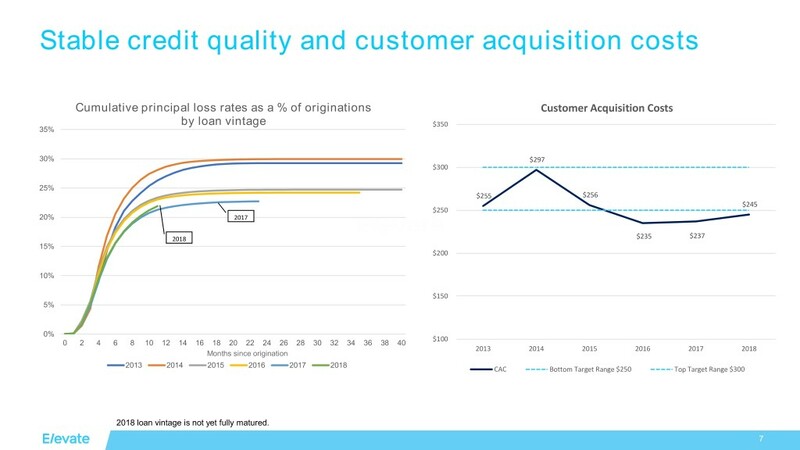 Combined loan loss reserve (which the Company uses as a non-GAAP measure). (1) Represents loans originated by third-party lenders through the CSO programs, which are not included in the Company's consolidated financial statements. (2) Represents finance charges earned by third-party lenders through the CSO programs, which are not included in the Company's consolidated financial statements. © 2017 Elevate. All Rights Reserved.